We can repair toilet cistern leaks, unblock toilets and if necessary, install or replace the complete toilet suite anywhere in Melbourne. Our vehicles are stocked with parts for most major brands for prompt repairs and installation. Our plumbers are experienced with all brands and types of toilets including disabled toilets, dual cisterns, concealed cisterns and even waterless toilets. 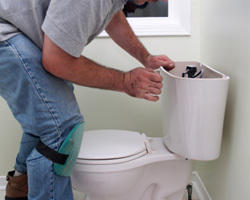 If you have a leaking or blocked toilet, call Woolley’s Plumbing on 1300 367 626. Leaking toilets can waste up to 73,500 litres of water per year, each. If your toilet bowl is cracked, generally it can be replaced as part of your household insurance.